The Netherlands is arguably the densest country in the EU at 1,159 people per square mile. The Amsterdam Metropolitan Area is its densest region and contains its largest and most important city at its heart, Amsterdam. 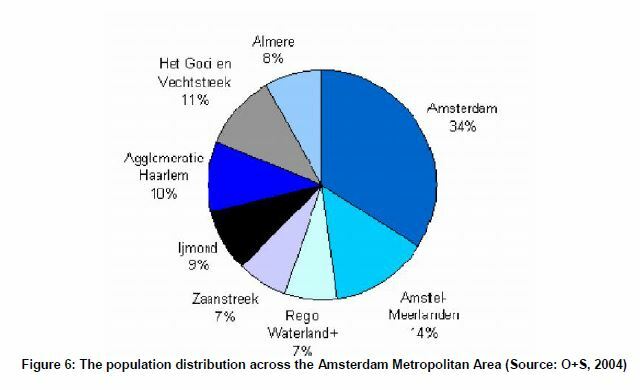 The city of Amsterdam contains the greatest proportion of AMA residents, followed by the Agglomeratie Haarlem and Gooi en Vechtsteek. Amsterdam city is very ethnically mixed. Only about half the residents are native Dutch. 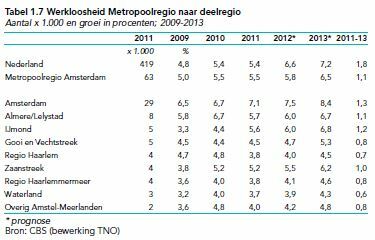 The metro is composed of slightly more native Dutch people (70%) while Netherlands as a whole stands at 81% Dutch.There are two very distinct immigrant populations, Western and non-Western. The non-Western population is concentrated are concentrated in the big cities and specifically in certain AMA boroughs outside the city center. Non-western populations consist of either immigrants from former Dutch colonies (Surinamese, Indonesian and Antilleans) or people who entered the country through the worker visa program (Turkish and Moroccan). Western immigrants are generally well-educated, short-term residents from other European countries (primarily Great-Britain and Germany), North America, and Japan. They concentrate more in the centers of economic activity (the heart of Amsterdam, Amstel-Meerlanden, and Haarlem). The AMA population is well-educated and multi-lingual. More than 40% of residents have a higher degree and 80% speak English. However, employment varies between the subregions. Notably, workers with fewer skills or less education are more frequently unemployed. With a shift towards a knowledge-intensive economy, the proportion of highly skilled workers in the region has gone from 10% in 1970 to 60% today. The City of Amsterdam notably has the highest level of unemployment of the subregions. The business centers (Haarlem and Amstel-Meerlanden) faired the best. In 2009 the unemployment rate of the AMA was at 5% and rose slightly to 5.5% from 2010 to 2011 as the economy slowly recovered from the worldwide recession. Another issue is the overall ageing of the labor force and low birth rates. Amsterdam and the AMA continues to attract younger people; however, as the Dutch age there are fewer young people to take over their places in the work force. If this trend continues, it will be harder to grow productivity and fund social programs like the state-run pension program. "Economische Verkenningen Metropoolregio Amsterdam 2012"
"Making City - Inspiration and the Search for New Strategies" City Policy Team and Amsterdam Metropolitan Area Team, 2012.